Today I’m going to release yet another free premium WordPress theme. After designing the theme, the first word that came into my mind was awesome. So I named this theme as WP Awesome. Last year I designed WP Perfect WordPress theme which was my first WordPress theme that got accepted in official WordPress directory. WP Awesome is a WordPress 3.0 ready theme with easy to manage theme options page. The users don’t need to edit the theme pages to make basic changes like to change logo, to show advertisements etc. The theme options page is powered by jQuery with drop down support. Download and extract the wp-perfect.zip file to your hard disk. Now upload the wp-perfect folder to http://yourblogname.com/wp-content/themes/ directory using any FTP program. Sign in to your WordPress admin panel and go to Appearance -> Themes. 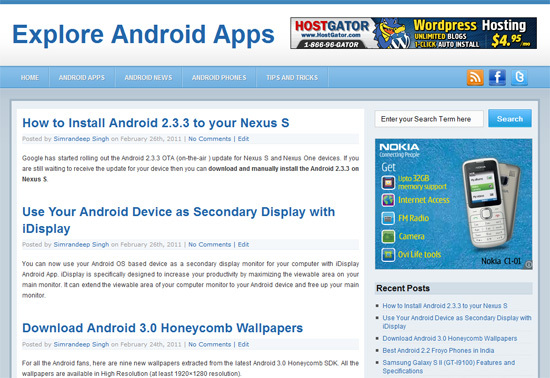 Activate the WP Perfect theme from the themes page. Thanks Simran for a nice theme. I am in middle of choosing between WP Perfect and WP Awesome :-), so can you share more differences and/or how you compare those two. It seems that the simpler and sleeker looking themes are very popular these days. There is just something about the plain white background against a light background that really stands out and makes visitors feel at ease. I suppose I am a bit of a fan of blue, especially the lighter shades. It probably doesn’t hurt to get all of those backlinks from people using the theme.